Home / Weather / Gorio: Who Got the Storm Track Right? Gorio: Who Got the Storm Track Right? I will be the first to say that this is past the stage of being a matter of life and death; if at all it ever was, because tropical storm ‘Gorio’ – international code name ‘Rumbia’ – was not even strong enough to warrant a ‘typhoon’ categorisation. 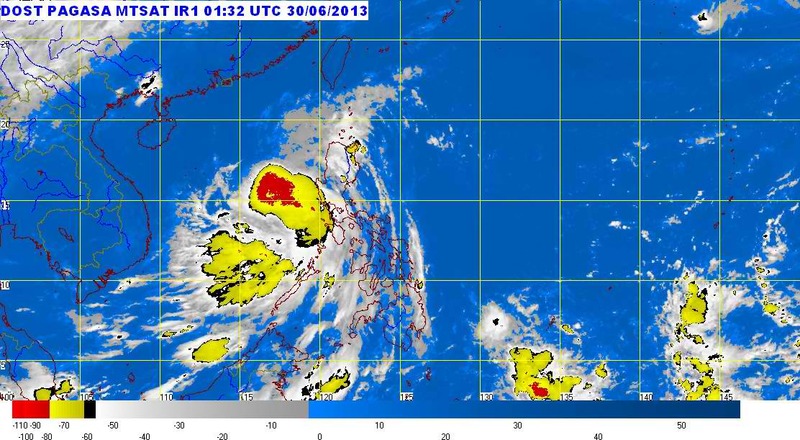 It is a matter of curiosity that PAGASA’s tracking of Gorio did not seem to agree with those of several international weather stations; and not least because several government agencies are dependent on what PAGASA had to say on the matter. 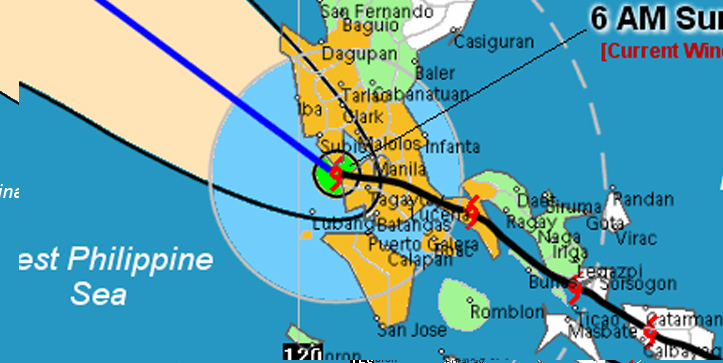 The last update I read at the PAGASA web site last night before going to sleep was an 11 o’clock statement that said that Gorio was 40 kilometres northeast of Calapan City in Oriental Mindoro. This, in nautical terms, is right in the neighbourhood. The curiosity was that, while it was raining, it was no more than your average tropical downpour. Whatever winds there were I could not say were significant. Then I went to sleep. Soundly. It was, after all, your invitingly typical bed weather. When I woke up, there were still drizzles; but no more. It was as if the storm never was. Truth be told, I was expecting to be awakened in the middle of the night by the hissing of the wind and the rustling sound of leaves being blown this way and that. Fortuitously, the power did not appear to even have been put out. When I checked the weather web sites, I read that PAGASA had said that Gorio was ‘somewhere in the vicinity of Batangas in its 2-4 o’clock updates. Now this was a surprise. Either I had slept like the proverbial log or Gorio had lost its steam while over land. 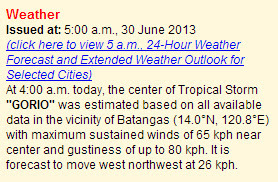 Except that PAGASA’s own web site stated that it had more or less maintained its wind speed. I must have slept like a log. But then, checking with Typhoon2000, which conveniently makes available forecasts made by international agencies, it appears that everyone else had tracked Gorio traversing Luzon I would say north of Manila. 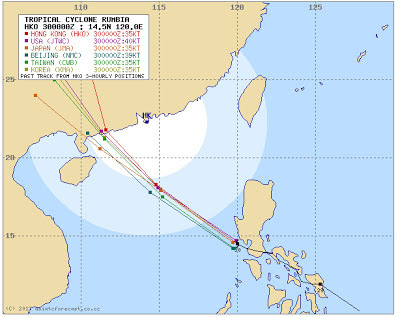 For good measure, take a look at the tracks laid down by the US Navy’s Joint Typhoon Warning Center, and the weather agencies of Japan, Taiwan, Hong Kong, China and Korea. Everyone more or less agreed on a more northerly track. Needless to say, the implications for disaster planning and response by these forecast tracks are huge. At this point, the obvious question is, who got the tracking right? 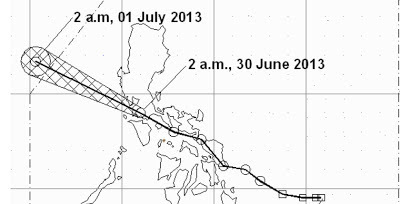 It is either PAGASA got the track right and everyone else wrong; or the other way around. I am in not in a position to say. Do not jump to conclusions, however. When typhoon ‘Basyang’ came a-visiting a few years back, PAGASA received a lot of flak for its forecast, which coincided with everyone else’s. Only the University of Wisconsin’s track turned out to be correct. For all we know, it was PAGASA who got its track right. Only if it did, I really must have slept like a log.